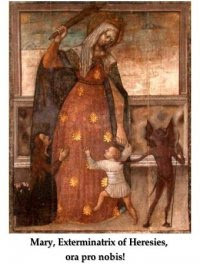 Let us contemplate this inspiring image: Our Lady is clutching her children close to her side, with a really, big stick to crack over the head of the devil! Via Journey to Therese. Ok, that was not the picture at Fr. Bryces' blog. It was another similar picture from the same period. The image here hangs at the Abbey of San Felice in Giano del Umbria, the House where the Missionaries of the Precious Blood were founded in 1815. The image was painted in 1494 and hangs in the cloister. This photo has been making it around the web since I posted it to my blog. I took the picture bake in 1993. A 20x30 print hangs nicely framed over my fireplace. The title on the painting is "Madonna del Soccorso" It was someone else in the blogosphere who gave it this other title. If anyone wants a larger image, just email me at my blog. The quality of the imge here is really not very good. My favorite part of the image is the benedictine monks cowering behind Mary.